During our monthly training classes, I notice a strong interest in being able to make sales and transactions forecast by participants from retail industry and financial institutions. Their face lit up when I tell them that there are a couple of forecast tools in Microsoft Excel they can make good use of. In today's post, I will be walking you through those forecast tools with a focus on using them to make sales forecast. People are usually surprised when I show them this tool. 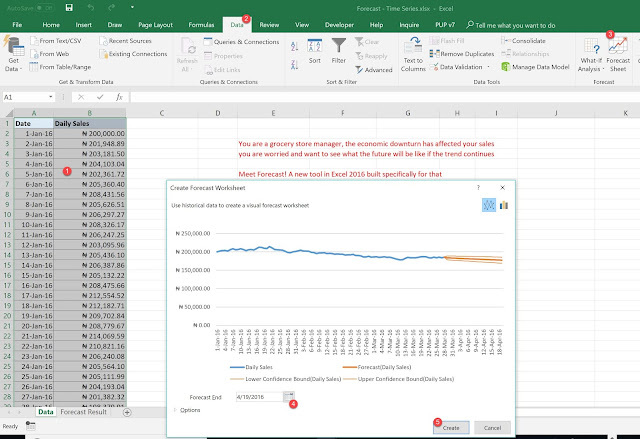 It is one of the tools added to Excel 2016 and Office 365, and you will find it under Data menu. 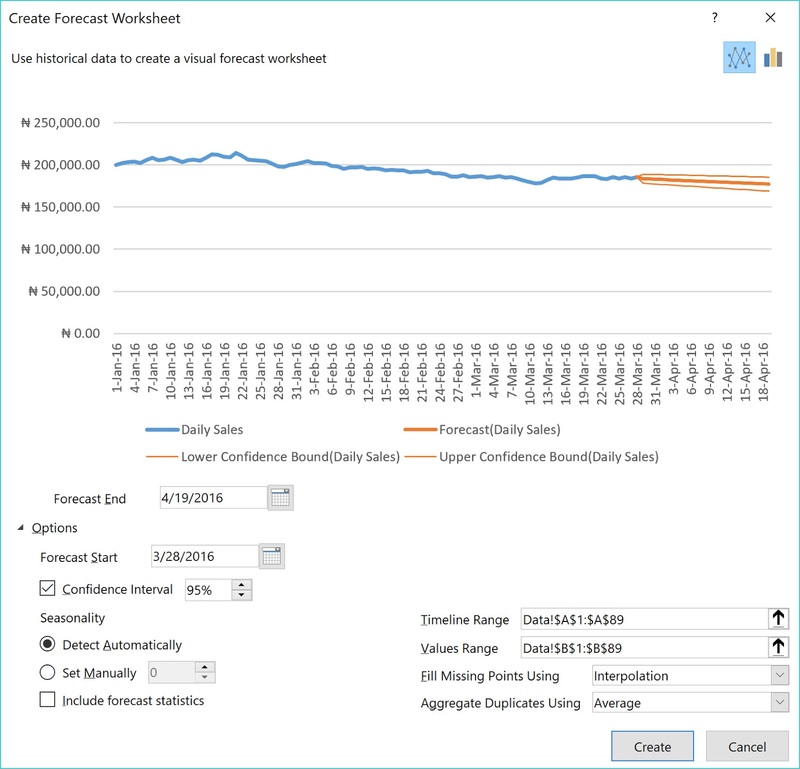 With it you can make very useful time series forecasts that takes into consideration trend and seasonality in your data. Let's say you work for Cadbury and would like to forecast sales for the ever yummy Bournvita beverage; it is common sense to factor in the reality that sales always spike in some specific months of the year (Christmas hampers period etc.). That is what is beautifully handled by the seasonality component of the forecast sheet tool. And there is also trend (are sales generally trending upwards or downwards). 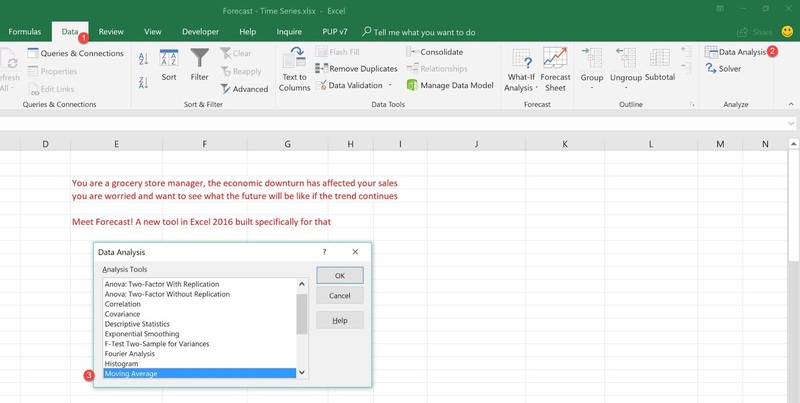 What I most like about it is the flexibility Microsoft put into it: you can handle missing records, set confidence interval, and even let it automatically detect the seasonality. 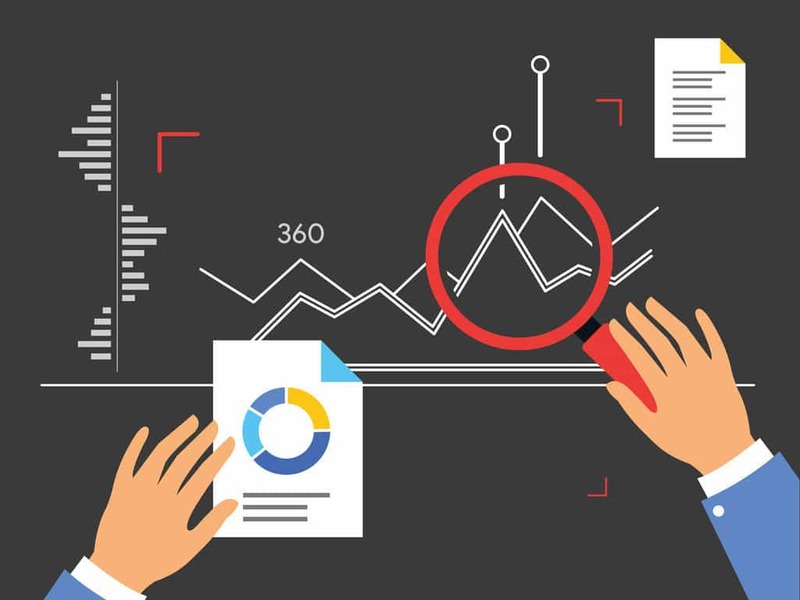 This is the most common forecasting method I see business people use. Any time you are projecting the average growth for the last couple of months or years forward, you are doing plain vanilla Moving Average. Then whenever you take that average and add a magic number to it (like we do in coming up with optimistic case and pessimistic case in most financial modelling), you are still doing Moving Average -- the strawberry and lemon flavoured version of it. And whenever management says they want to double growth rate year on year for the next three years; that, again, is Moving Average. So how do you do it in Microsoft Excel? If you are okay with typing a simple formula in Excel, then just doing =AVERAGE(last x periods) gets you there. However, if you are not on friendly terms with Excel formulas, you can take advantage of Moving Average in Excel Data Analysis Toolpak. Let's say you work for Julius Berger Construction company. The company revenue depends on Federal Government budget, GDP growth rate, number of meetings with potential clients, which party is in power, PMI and FDI. Perhaps way more than which month of the year we are in or the previous years revenue. Then it would make better sense to do a forecast model that combines all those factors and give you some sense of what type of revenue figure to expect this year. And more importantly, show you which factors strongly influence your revenue and which are not very important, plus how much you need to do as regards the factors under your control in order to achieve a specific desired revenue goal. That forecast model is regression. It requires a fairly good deal of statistics knowledge but is well worth the work. 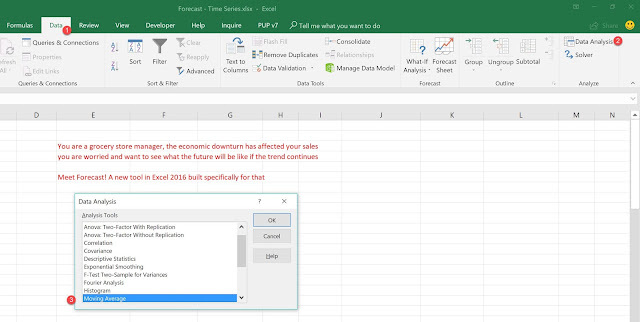 And Excel has a tool that takes away most of the computational headache. You just do a couple of clicks and read a blog post on how to interpret + use the regression tool results. 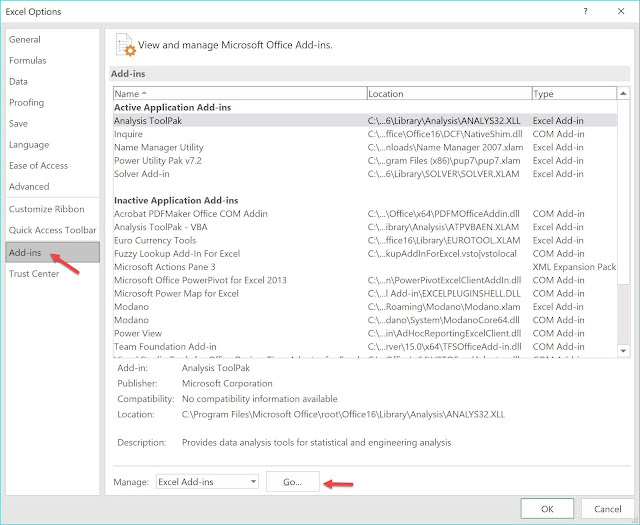 You'll find it under the Data Analysis Toolpak I earlier showed you how to activate. 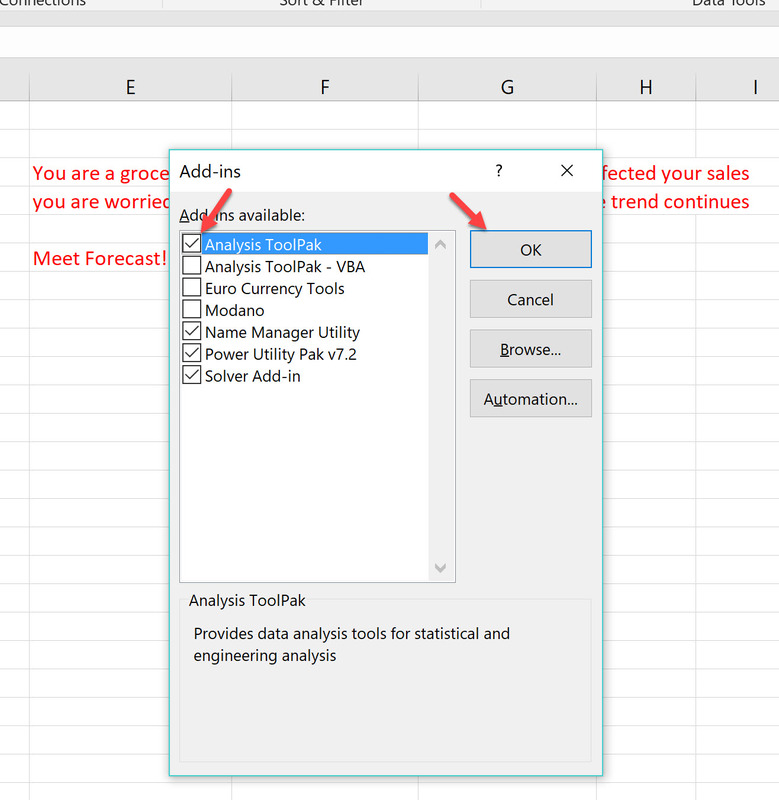 And these are the common sales forecasting tools you should be conversant with in Microsoft Excel. If you look through the Data Analysis Toolpak, you'll find a couple more.